SEATTLE--(BUSINESS WIRE)--Amazon.com, Inc. (NASDAQ: AMZN) today announced Prime Now, the newest benefit for Prime members, which offers one-hour delivery on tens of thousands of daily essentials through a mobile app. Prime Now is powered by Amazon’s growing network of fulfillment centers that utilize high-end technology to speed up order delivery times for customers. Now, Prime members can get products like paper towels, shampoo, books, toys and batteries delivered right to their door in an hour or less. Amazon is launching Prime Now in select areas of Manhattan today. All Prime members can immediately download the Prime Now app, available on iOS and Android devices, and will be notified when the service is available in their local area. 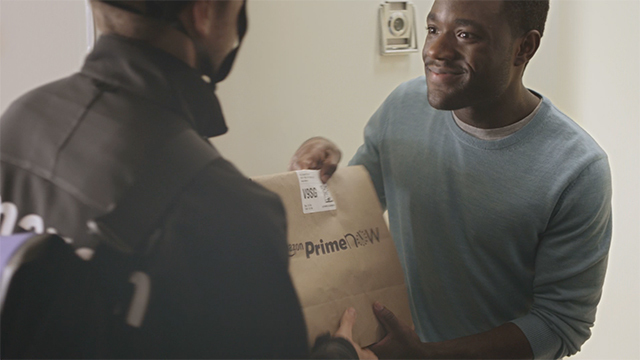 Prime Now is available from 6 a.m. to midnight, seven days a week. Two-hour delivery is free and one-hour delivery is available for $7.99. A portion of Amazon’s new building on 34th Street in Manhattan will serve as a hub for delivery of Prime Now orders. Tens of millions of members around the world already enjoy Prime. In the US, membership includes unlimited Free Two-Day Shipping on more than 20 million items, instant streaming of tens of thousands of movies and TV episodes through Prime Instant Video, one million songs and hundreds of playlists through Prime Music, free unlimited photo storage through Amazon’s Cloud Drive, early access to select Lightning Deals and access to over 600,000 books to borrow through the Kindle Owners’ Lending Library. Learn more about Amazon Prime Now and download the mobile app at www.amazon.com/primenow. Amazon Prime is an annual membership program for $99 a year that offers customers unlimited Free Two-Day Shipping on more than 20 million items across all categories, unlimited streaming of tens of thousands of movies and TV episodes with Prime Instant Video, one million songs and hundreds of playlists with Prime Music, early access to select Lightning Deals and access to more than 600,000 books to borrow with the Kindle Owners' Lending Library. Not a member? Start a free trial of Amazon Prime at www.amazon.com/prime.